Optimization of marketing messages goes beyond concise copywriting and keeping messages short. Readers are viewing emails and marketing content on many different screen sizes and with varying levels of connection speeds, so it's important to consider not only the amount of content being delivered, but also the size. Optimizing images for fast download speeds while keeping image quality high can be tricky, but with the right tools and some fine-tuning, images can be sized appropriately. The two important measurements of email size are: the HTML size and the total email size. The total email size includes all the HTML, styles, and images. All of this content needs to be downloaded when the reader opens the message. Most of the more frequently used inboxes will automatically download images when the message is opened, but some inboxes still require the reader to choose to download images. Try to keep the total email size less than 1MB. While email read times have been increasing overall, marketers only have about 3 to 4 seconds to get their readers attention. 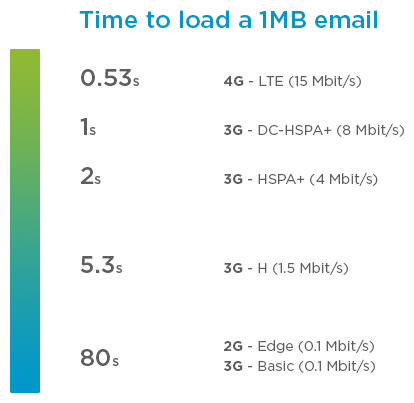 It's important to optimize messages to ensure the fastest download speeds for readers on a variety of connections. The quality of print images are usually saved at 300dpi (dots per inch), while web graphics should always be saved at 72ppi (pixels per inch). Reducing your photos and graphics to this resolution ultimately decreases the file size. JPG: Used for photography, such as product and lifestyle shots. JPGs are often the largest in file size, but they allow for compression. These images should be compressed to reduce the quality to an acceptable limit. PNG-8/GIF: Used for flat graphics such as text, logos, and social media icons. GIFs can also be used for animations. That's GIF, not JIF. PNG-24: Best used for images that include a combination of photography, text, and graphics. Our suggestion is to only increase the size of images for retina when they contain text, or if the image is already a small file size and contains graphics like a logo or social media icon. Increasing a photo-realistic JPG image of a product or lifestyle shot won't be worth the increased file size. Photoshop: The most frequently used tool for optimizing images is Photoshop. When saving images for use in email or the web, you'll want to select the Save For Web option. This gives you control of the image format and quality. Here is an article from Adobe explaining optimizing images.